So I happened upon this website that did a spotlight on cool, small kitchens. 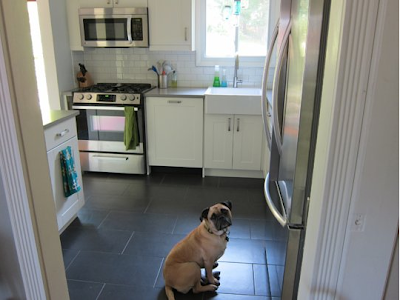 I love this one because of the clean lines, organized space and the nice appliances the owners put in (apparently it was a wreck when they bought the house) and that she included her adorable pug in the photo shoot. The funny thing is that if I saw this kitchen in any apartment viewing, I would exclaim "Holy crap! Look at the size of this kitchen, it's amazing! "I guess that's the difference of living in Ossining and NYC. Actually, we are somewhat in limbo about if we are going to move out of our place because of the impending 3rd tiny person coming to live with us in September, and the hubs said that he would probably be sold on the first apartment he saw with a nice kitchen counter. The other thing I love about this kitchen is that the space is set up well - the counters are all within arms reach of the stove, the dishwasher is directly next to the sink and the main triangle (fridge, oven, island) are all within easy access to each other. So even though this probably wouldn't be considered a "chef's kitchen" (and what does that really mean anyway, NYC REAL ESTATE BROKERS!!!!????) I think you could easily make a big meal for a number of people without too much hassle. kitchen and bathroom is more than simply a place to prepare meals; it is the essence of your home and an investment in your lifestyle. Whether you are looking to create a bold and punchy contrast or an understated look to coordinate with your surroundings, our team at Kitchen Essence ensure that the result reflects the character of the owner and the home.